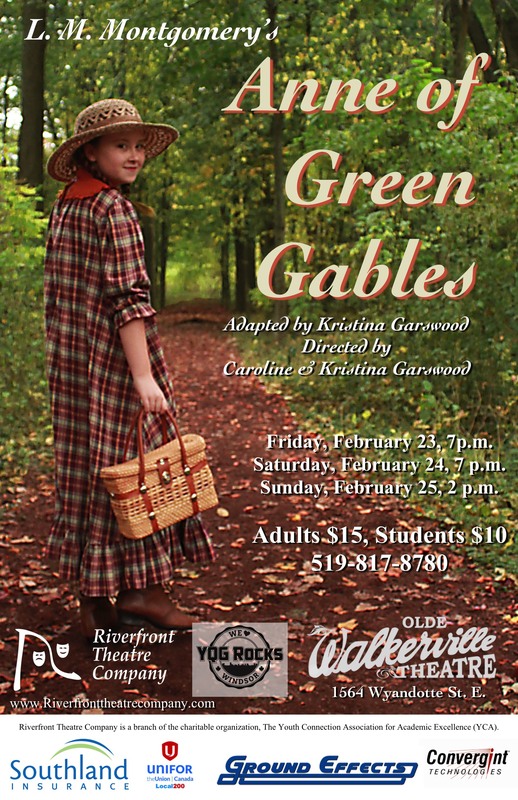 Riverfront Theatre Company’s production of Anne of Green Gables will be opening in just one week at the Olde Walkerville Theatre! We thought this would be a good time to introduce you to our two actresses playing Anne Shirley, the title role. Because the play, like the novel, spans a period of five years, we wanted to divide the role up between two different actresses. Alisa Whalen (11 years old, in her 2nd year with RTC) will be playing the role of younger Anne, from the time she arrives in Avonlea up until shortly after the dreadful incident of the raspberry cordial. When the time comes to start taking courses to prepare for Queen’s University, Grace Clarkson (age 14, in her 7th year with RTC) will take over for the remainder of the story. We recently interviewed our young actresses to ask them about their experience with this production. Q: What excites you about playing Anne? Alisa: This summer, I read the books, and I really liked Anne’s personality. I just thought the way she was so dramatic about everything that happened to her was so fun! Grace: I’ve never played a lead before, and I really welcome the challenge of playing a character with this range of emotions. Q: What are you learning from this role? Alisa: I’m learning a lot about blocking – I have a lot more movement than I had in last year’s plays. I’m learning even more about memorizing my lines. I’m also learning a lot about how to deliver those lines effectively, to keep them interesting. Grace: It’s a challenging role, and there are a lot of lines to memorize. The vocabulary is a lot different from today’s, and the structure trips me up sometimes. Q: Do you like playing Anne? Alisa: Yes, because she gets to do a lot of different things. Also, she gets in trouble – a lot more trouble than I do, so I get to do strange things I never thought I’d do in my lifetime! Grace: Yes, because it’s something that I can really work hard on, but also have fun with – there’s a lot of artistic freedom I can bring to putting Anne across to the audience. Q: Do you feel pressure about being Anne? Alisa: Yes – the biggest pressure is about getting all the lines and the blocking right. I have one scene where I have almost a full page of uninterrupted talking, and it’s hard. I have to put a lot of thought into how to deliver different lines, and make it all seem natural, and give people the Anne they expect to see, with all her ups and downs in drama. Grace: Sort of. I have a bit of pressure to be like Alisa, for continuity, but also pressure to be like Anne herself, more mature. I feel like there’s a lot of pressure to live up to being like the actress who played Anne in the movie (Megan Follows), or from their own image of her from reading the books. She’s an iconic character, and people have their own visions of what Anne is supposed to be. So I have my ideas, traditional portrayals, what my directors are looking for, what people have always expected to see – and I have to merge that all together. Q: How are you and Anne Shirley alike, and how are you different? Alisa: Anne is like me, because I can sometimes be a bit over-dramatic, and we both have a lot of attitude. But I think Anne can be a lot more mean than I am (to the other kids in her class, and to Gilbert), and I don’t do a lot of the impulsive things that she does. Grace: Anne and I both talk a lot, and quickly, and get excited easily. We have different pasts, and of course are from very different times, so we express ourselves differently. I feel like I’m glad to be playing older Anne, because she’s more emotionally restrained, which suits me more. Q: What’s your very favourite line in this show? Alisa: I have so many that it’s hard to pick. The cast laughs the hardest, I think, when I apologise to Mrs. Lynde, but I think my favourite is the part where Diana’s getting drunk while I tell her about my daydream about her getting smallpox and me taking care of her, because I get to be so dramatic, and it’s pretty funny, when you think about it. Grace: I actually like just running out onto the stage calling out “Merry Christmas” in the scene where I get the dress with puffed sleeves. I love Christmas, and it’s one of the brightest, happiest moments that older Anne has on the stage. These two young women will bring their cast together February 23-25th at the Olde Walkerville. Tickets are available online, or through the box office one hour before each show. Don’t miss our fresh adaptation of Canada’s most-beloved classic. Next: Next post: Opening This Weekend!